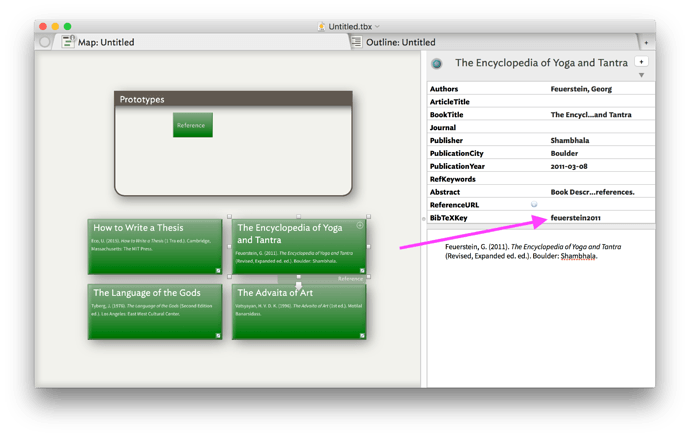 Bookends can generate a BibTeX key for a reference, and it puts that key into a field called “Key”. That field doesn’t come along when Option+CMD clicking and dragging from Bookends to Tinderbox. I looked at the attribute browser to see if it might have been included in one of the other RIS fields, but I don’t see it. I can manually copy it, but since I use Pandoc to generate bibliographies, it would be helpful to have this key automatically import as an attribute of the reference in Tinderbox so I could include it in exported text. Does anyone know how to automate this, or is it something that the developers would have to work out? (I suspect the latter but would appreciate any pointers). This is doesn’t work by default in either Bookends or Tinderbox, but it is completely doable. Note that the U1 field must come before the ER “end record” field. 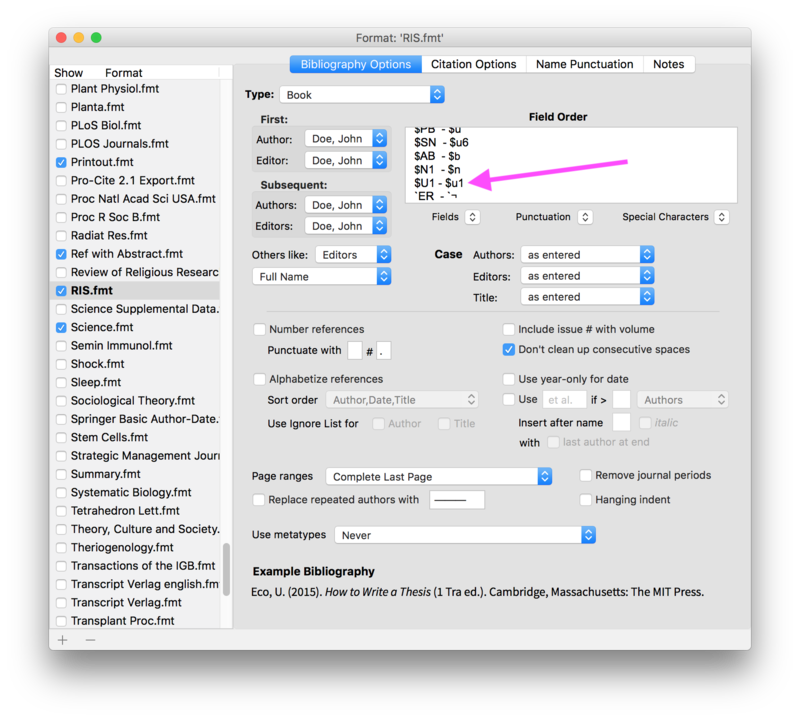 Once you have done this for every type of reference that you use (book, journal, etc. ), the BibTeX key will now be included in all the RIS records that are exported from Bookends. This edict basically says that if the note’s RIS record contains a line of the form “U1 - abcde…” then assign “abcde…” to the note’s $BibTeXKey. Has anything changed in TBX since the above was posted? I am unable to get this to work, either in my own file or using the example document above. Thank you. Lots has changed, but nothing that ought to affect the workaround above. Have you modified the default RIS format as above? Let me know if you have, and I’ll have a look. Yes, I’ve modified the default RIS format as instructed, and downloaded the example document, making sure that the edict was correct. No luck. Can you email me the document you’re trying this on? That would save a few steps. We’ve found the problem: using the edict code kindly provided by Galen above, there can only be one space before and after the hyphen. In my copy of Bookends, the RIS format had two spaces before the hyphen in all the existing fields, and I thus assumed that this was necessary for the manually-added U1. After making it only one space before the hyphen in my Bookends’ RIS record for the added line “$U1 - $u1”, the BibTeX Key is being imported correctly into Tinderbox.